This mile-long canyon, through which the River Droma rushes, takes its name from the Gaelic for ‘ugly hollow’. But that’s as far from the truth as can be. Corrieshalloch is one of the most spectacular gorges of its type in Britain and provides striking evidence of how glacial meltwater can create deep gorges. The meltwater followed natural faults in the bedrock during several episodes of glaciation during the Quaternary ice ages, between 2.6 million and 11,500 years ago. A short steep walk will bring you to a Victorian suspension bridge, where you can gaze down over a series of crashing waterfalls. Breathe in the Corrieshalloch air, infused with pine scents and droplets of water, and let the noise of the thundering waterfalls and the rushing river rumble through you. The suspension bridge was built by John Fowler, the pioneering engineer responsible for the world’s first underground railway and joint chief engineer on the iconic Forth Railway Bridge. 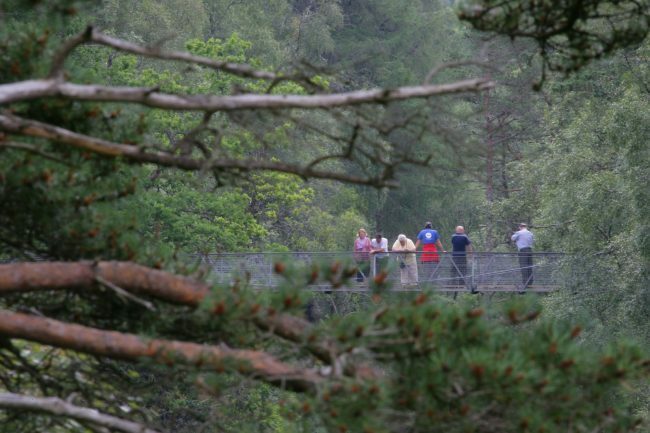 Corrieshalloch Gorge is designated a National Nature Reserve in recognition of the spectacular gorge and the surrounding woodland. It is also home to a nationally rare species of cranefly, which benefits from the wet dead wood in the shaded areas of the property.